One of the most significant changes in the internet is the increased use of mobile devices (smart phones, tablets, iPads) to search the internet. Currently 68% of all internet traffic is generated by Wi-Fi and mobile connected devices and over 48% of searches are conducted on a mobile device. This percentage is higher in non-urban areas where mobile phone internet service is better than may home internet services. This percentage will continue to increase in the future. When was the last time you looked at your website from your smart phone or iPad? You might be surprised at what you see. The graphics and the design may not show up correctly because desktop websites were not created to be seen on a mobile device. Websites that have not been designed to be mobile friendly, are usually not compatible with a mobile device and will appear smaller than you anticipated, contain much larger images and be harder to read. 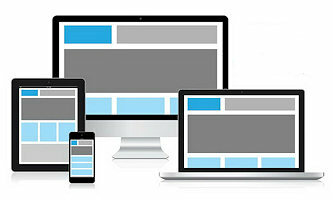 Google wants websites to work correctly on ALL devices and they recommend that the sites be “responsive” designed websites. Responsive web design (RWD) is an approach to web design aimed at allowing web pages to be viewed in response to the size of the device one is viewing with. In other words, a single website that can adapt in size to any device it is being viewed on. A "one site fits all" approach. This is more important than ever to have a website designed that will work on a desktop, laptop, tablet, iPad or smart phone. The search engines have developed separate algorithms for mobile searches and boosts the rankings of mobile-friendly sites if the search was made from a mobile device. If your site is not mobile-friendly you could loose traffic and visibility. DFW Web Design designs all new sites to be responsive and work on all devices. Even if you have an old site and do not have the budget to create a new site, we can work with you to create a small mobile-friendly site consisting of a few pages to help you with the search engines. A mobile application must be downloaded either from an online store such as the App Store or Google Play. The application is then saved on the smartphone or the tablet, and in most cases it does not require an internet connection in order to work. DFW Web Design can create a custom mobile app for both iPhone and Android devices. We will be happy to discuss with you whether or not you need an app or just a mobile website.